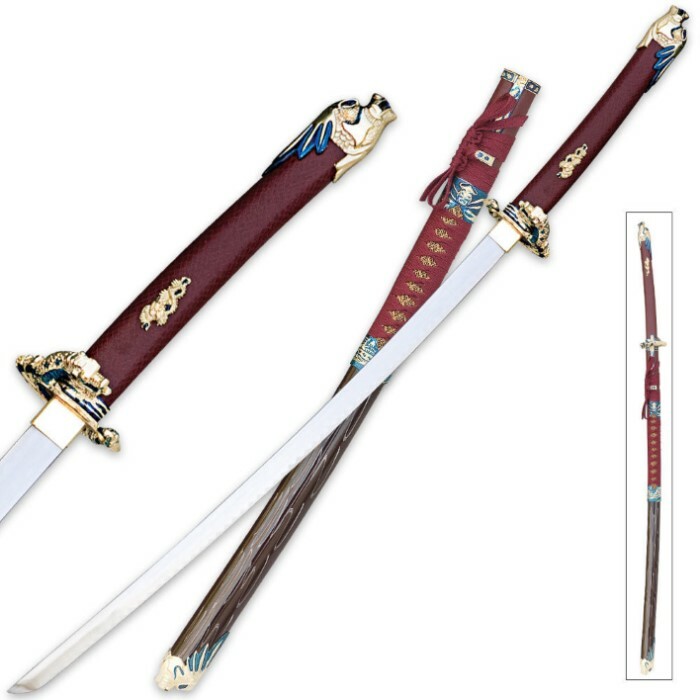 Oda Nobunaga Red Katana Sword | BUDK.com - Knives & Swords At The Lowest Prices! This beautiful example of the katana pays respect to one of feudal Japan's greatest samurai warriors. This exquisite weapon features a 26 1/2" carbon steel blade. 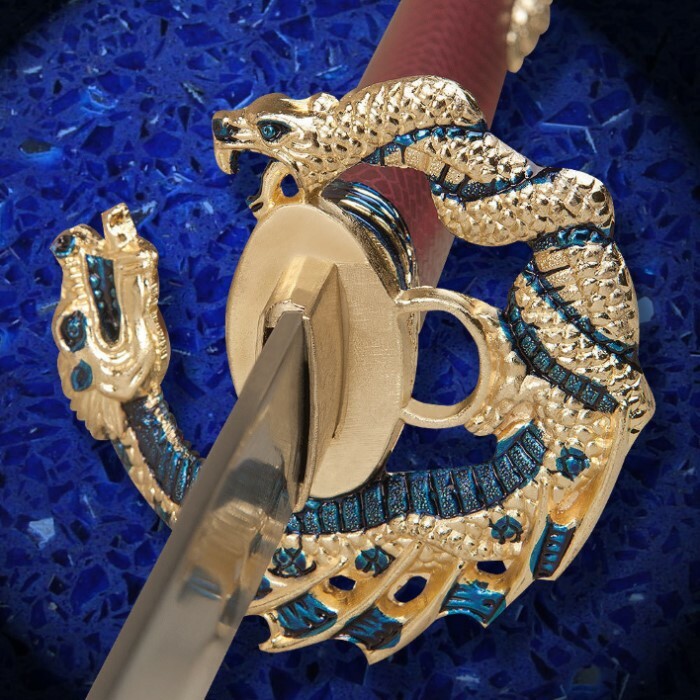 The cast metal handle features a unique entwined dragon and serpent tsuba along with a dragon head pommel both with a gold finish. The grip offers a simulated snake scale wrap. The scabbard also houses two concealed weapons, a throwing spike and throwing knife. Defintely hands down this sword is worth it, the pictures do not do it justice. it's a little heavy, i'm not quite sure about battle ready however definetly an awesome sword to add to my collection. Not impressed. Cheaply made blade, and dull. Ornamentations are nice for display. I brought this piece for display purposes only, and could not be more happy. At the cost for which I paid for this sword I did not expect to actually use it to cut anything even though it is sharp. If you like this piece to look at and enjoy its design I highly recommend it but don't buy it with the intentions of actually using it to cut anything. There is no way this is a battle ready sword when it is made with stainless steel and not carbon steel. Got this sword two days ago. Overall, I'm very happy with it. The dragon piece on the end is somewhat poorly and hastily painted, and the throwing knife doesn't fit in all the way and sticks out. The throwing pin is hardly what I would call a weapon, as it's rounded and about as sharp as a ballpoint pen. But that's just me being picky I suppose. The sword itself is very pretty, and the scabbard is really a work of art. The little metal piece in the handle is a little loose, but if it comes off it shouldn't be too hard to glue if need be. All and all, this is a gorgeous piece for your collection and will definitely stand out. First, for those who have absolutely no idea about all the parts like "tang" and other complicated things on a sword and only want to get a sword, is this a good sword? Yes, not bad for it's price. Now, this is nice, the steel is CARBON steel, not stainless, what does this mean? it means that it wont snap from how brittle it is, and even more awesome cutting power, it IS full tang, now one catch, this sword is duller than a bat, and I would say you would have to spend at LEAST 3-4 hours to sharpen this sword to a good edge, now imagine is if WAS sharpened (budk you listening?) that would be awesome! Complaints: some defects I found in my sword, the tsuba wobbles like mad, not gonna do much that is bad given the blade is held in by the handle, but it makes it feel a bit cheaper, also, i'm not the only one here to have defects in the sword. even still, return policies are nice given they work. Now, what is even cooler is that not only you get a sword, but a throwing spike and knife too! Collaborating to other reviewers: "this is not stainless, it will rust within 20 days" - that is because it is carbon steel, it actually is BETTER, if you do maintenance every once-in-a-while. "the knife and spike don't allign right" - found this on many reviewers, guess this is a defect, given I didn't have a problem with that Now to final thoughts: I say buyer beware, this sword seems to frequently come with defects, but none that are unfixable, if you know how to do even basic maintenance, you should be fine getting this sword. And the fact this blade had alot of good things for low price makes me happier to have this in my collection. budk, not a bad job on this sword, but checking everything is right so defects arent as common seems to be what you should start to do for this sword. Short review: I am highly impressed with this sword. It's not overly expensive but has a very nice traditional opulent look. All the dÃ©cor makes it seem more like a royal blade than one that would belong to a soldier in the field. It has some flaws, but what do you expect for 30 bucks? Despite what the bullet points above say, the blade is made of CARBON STEEL (labeled directly on the blade), not stainless. That said, this blade can be used without concern. The full tang also ensures that this blade is battle ready. I wasn't quite sure what to expect in terms of dÃ©cor due to the low cost, but I am not disappointed. The hilt is covered with beautiful sculptures of dragons along with a metal dragon pommel at the end. (the dragons on the actual hilt are just plastic). The tsuba is really neatly done and also made of metal. It's unique because one part of it is lower than the other so it's like a spiral more than a flat circle. The scabbard is coated with almost too many details to talk about! It's wrapped with a nice red cord, has several colored metal bands around it, and has a very nice golden textured cloth wrapped inside the cord. The rest of the sheath is a very glossy red with some abstract markings. The markings look a bit like scribbles at first, but I think they're actually quite a nice touch. The end of the sheath has another metal gold dragon head on it. There is also a throwing spike and throwing knife hidden within the sheath, but to be perfectly honest, they are not worth much more than decoration. That's the only flaw so far! I better get to the blade before I run out of character space. It's not highly polished, or very sharp out of the box. Just take a polishing kit (or even some alcohol) and clean it off. The blunt blade is great though! Why? You can sharpen it how you like! It may even be able to be sharpened as a single bevel blade. Overall, this is a very nice sword for the money. Good value as always! I just got this beautiful katana today and I absolutely love it. It is so very beautiful and what makes it even better is that its razor sharp. I'm bigger into sharp weapons instead of displays. I highly recommend this katana.